If you find yourself in a situation with a few moms you don’t know very well, try some of these funny icebreakers to get the conversation flowing! You’re standing with another mom at the playground and notice her underwear is showing, do you tell her? What do you say? If you had a 25 hour day and everyone else still only had 24, what would you do with the extra time? Is there a food that you think is really gross but you make your kids eat it because it’s good for them? If you were stranded with your kids what are the three things you hope you’d have on hand? What kid’s show do you wish you could eliminate so that no mom ever has to sit through it again? At what age did your kids stop embarrassing you and you started to embarrass them? What’s something in your house that for some reason only a mom’s eyes can see? What would you change about your favorite restaurant to make it more kid-friendly? Do you have a secret fear that you hide from your kids? 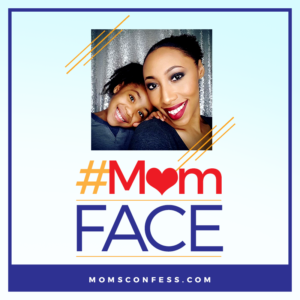 If there was one mommy duty that you would never have to do again, what would it be? Looking for a new activity for your next mom’s night out event? 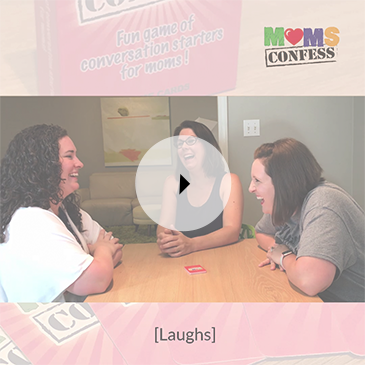 The Moms Confess card game is a great icebreaker to help moms laugh, vent and connect. Hurry and get the game now before you forget #mombrain. Too hard to get all your mom friends together in one place at one time? Try group text messaging or Facebook messenger! Post a question and let everyone respond. Not being in person may even make it easier for some moms to feel more comfortable participating. 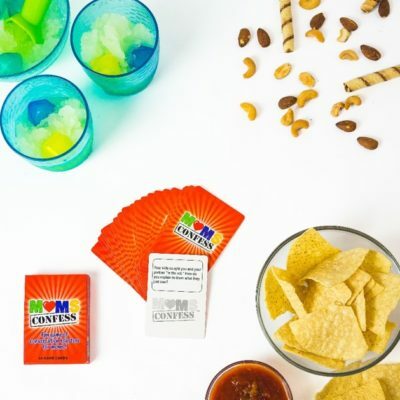 If you’re hosting a game night, mom’s night out, mother’s support group meeting or even a baby shower and have 5 or more moms, type up or write out one question per piece of paper and mix them all up in a glass bowl. 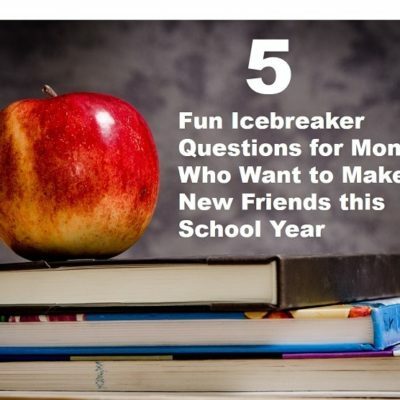 Take turns picking and responding to these icebreakers. Keep the rules loose, if other moms want to chime in on someone’s response go for it. Remember this is less about playing the game “right” and more about connecting with the other moms. 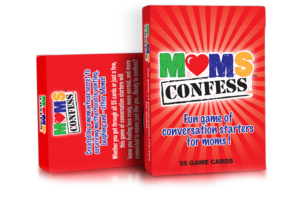 Moms Confess is a fun card game of conversation starters created by a mom for moms. The rules are simple… have fun, be honest, and promise not to judge. Are you ready to confess? If you happen to be on a playdate with one other mom, take a screen shot of the list of questions above. Don’t be so formal to ask if she wants to play an icebreaker game with you. 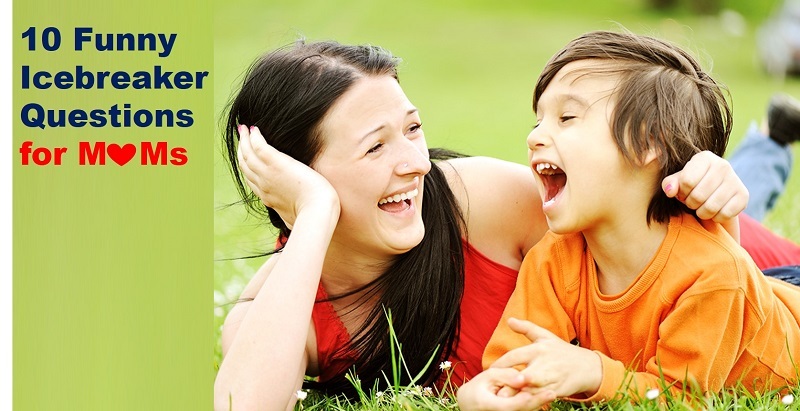 Let it flow something like this, “Hey I stumbled upon these really funny icebreakers for moms. 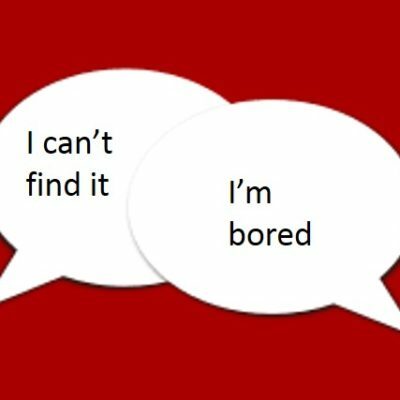 Want to hear one?” Read a question. If she automatically responds – awesome, if she doesn’t tell her why you think the question is funny or really relatable and share your answer that should help to get the conversation flowing. So tell us moms, which of the icebreakers listed above are your favorite? Feel free to post the Q and your A below! If you like these icebreakers you’ll love our card game, check it out! Cool idea. As I read each one, I was thinking I would comment that you should make it into a game, then I see it, lol. Don’t know if it’s my “favorite”, but certainly timely. #19, What question might your kid ask that you aren’t ready to answer? ….my kids 9 & 10 came off the bus asking about BJ’s…yikes. Hi Laurie, thanks for checking out our post! It is so awesome that your kids feel comfortable asking you anything…we’re so anxious to hear how you tackled that question!!!! Yikes indeed!!! BTW – yes, we also sell a game of conversation starters if you’re interested in it use confess15 at checkout to save 15% + free shipping!! Oh, these questions are so much fun! I was laughing just thinking about some of my answers. I can only imagine my mom friend’s answers! LOVE this feedback, thank you! We hope you get a chance to try a few out with your mom friends! Hey Mom! Thanks for stopping by to check out our post.So glad to hear you could relate to each of the questions. Feel free to confess to a question here or on our Facebook page! !